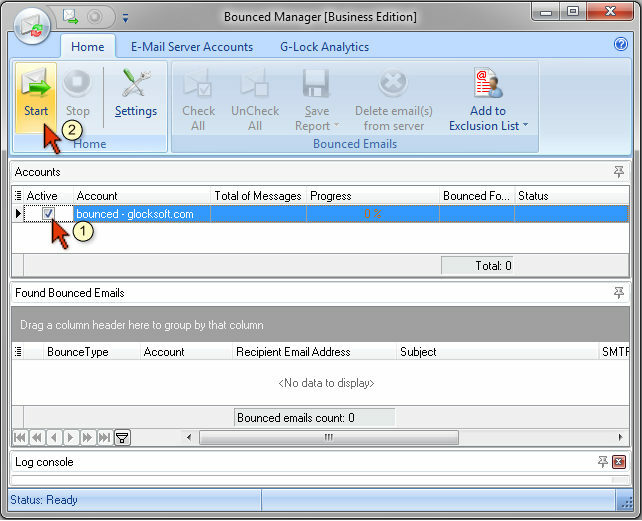 With the Bounced Manager module in G-Lock EasyMail you can handle bounced emails after your email campaign is complete. The Bounced Manager provides you with the most accurate bounce detection solution. It downloads your bounces, classifies them, and helps you remove bad email addresses from your email lists. Email Address – email address that you will check for bounced emails. You can go to a regular account settings in G-Lock EasyMail, copy the email address from the "Return Email Address" field and paste it in the "Email Address" field in the Bounced Manager. 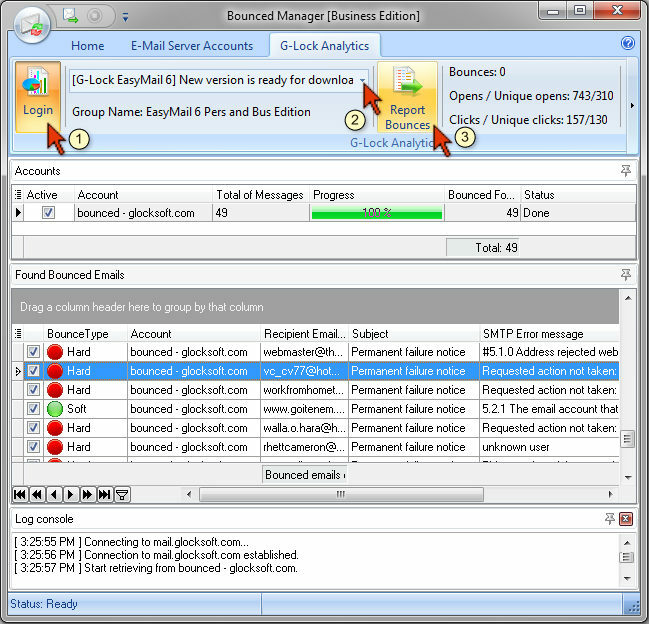 With G-Lock EasyMail you can collect bounced emails to a specific account so they do not mix up with other messages on your main account. 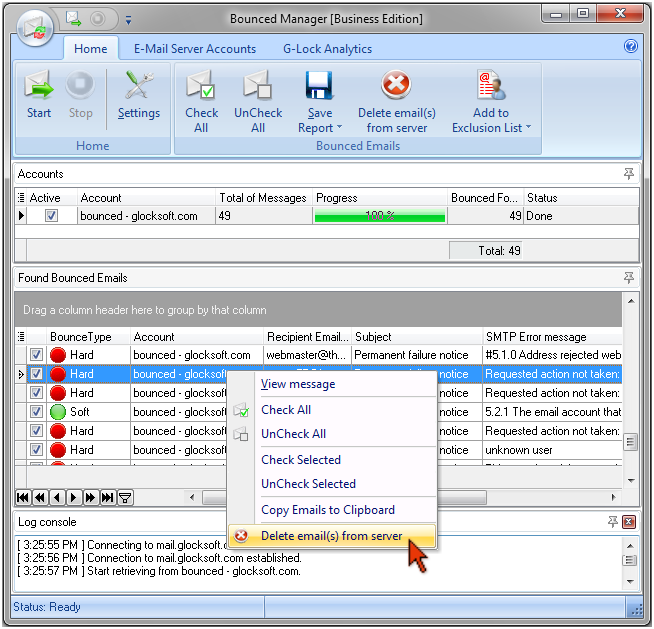 To do this, enter a specific account name dedicated to bounced messages into the "Return E-mail Address" field in the General Account Settings of G-Lock EasyMail. 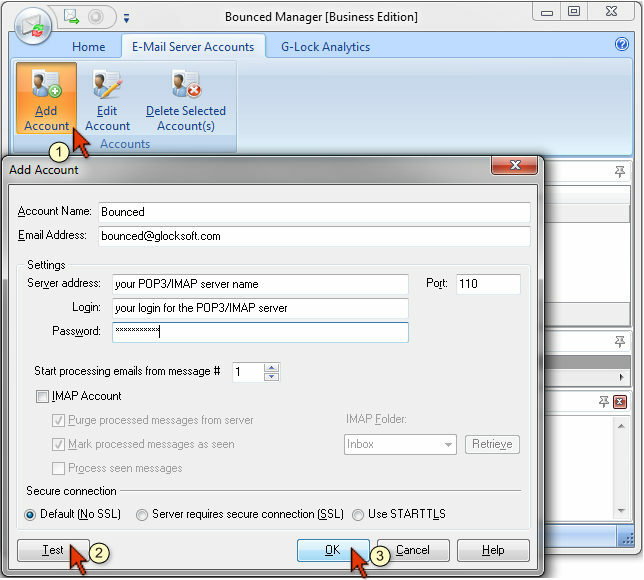 Server address – your POP3 or IMAP server name. If you have an IMAP account, check the "IMAP Account" box further. If you use the IMAP account on Gmail, select All Mail IMAP folder to retrieve bounce messages from. To test if the account works, click Test. If the test passes, click OK to save the account. After the account is setup, check the box next to the account and click Start. Hard The mail server could not send the message. The most common example of a hard bounce is if the user doesn't exist on that domain, or the mailbox is unavailable, or the email address is invalid. Soft The recipient's mail server is temporarily unable to accept the message. This usually happens when the user's mailbox is full, or the user is over quota, or the mail domain is unrouteable. Blocked Indicates that the recipient's mail server blocked the message sent from your IP address or from your mail server's IP address. Temporary The mail server is temporarily unable to send your message. This usually happens if the mailbox is temporarily disabled or not found. Spam Indicates that the message was blocked by anti-spam filters on the recipient's mail server or email client. MDN Indicates that the message is a Message Disposition Notification, commonly known as a "read receipt". Warning Indicates that the mail server will try to deliver the message again. Unknown Indicates that the program was not able to detect the type of the bounce message. After bounced emails are retrieved from the server, you can quickly save them to a file for further usage. The Save Report option allows you save either bounced email addresses only, or bounced emails with additional fields like Type, Account, Subject, SMTP error message, Message Status, Message ID, and MsgiNum. To save bounced emails of the specific type only, click a down arrow in the type field heading and select the emails type, for example, Hard. The filter will show hard bounced emails only. Then click Save Report and select a save option. If you want to save the files with bounced email addresses to another place, you can select a different location in the Bounced Manager settings. The Bounced Manager creates a unique file name for every session and inserts the date and time into the file name, for example Bounced_2006-Dec-20 [13.27.19].txt. Using the Export Wizard you can export bounced emails and additional fields to different file formats including MS Excel, MS Access and other databases. You can add bounced email addresses to the Exclusion List of the group or database directly from the Bounced Manager module. 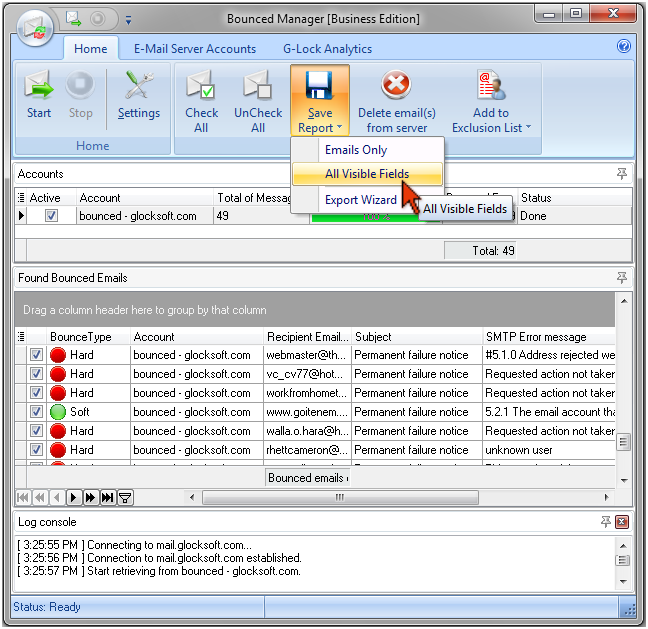 Bounced emails will be added to the Exclusion List of the selected group or database. Then you can login to your G-Lock Analytics account, click on the campaign name and look at the Overview report. You'll see the number of bounced emails found by the Bounced Manager. 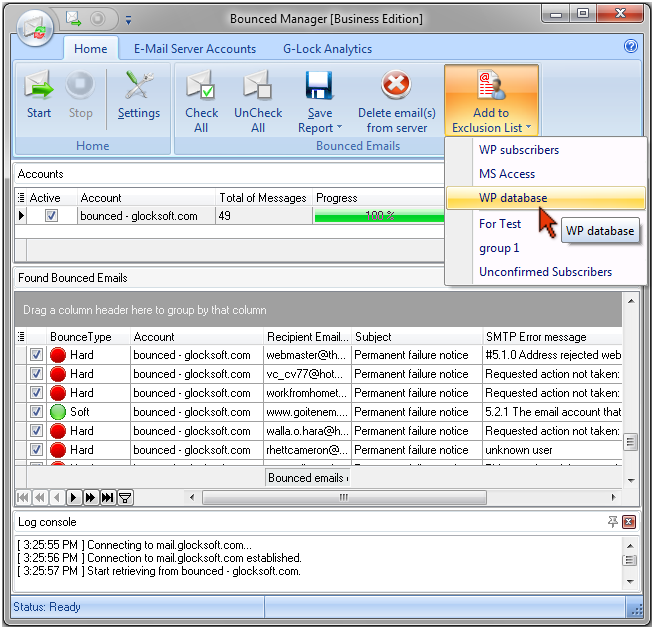 After you saved bounced emails to a file, reported them to G-Lock Analytics or added them to the exclusion list, click "Delete email(s) from server" option to delete bounced messages from the mail server. If you work with Gmail IMAP server, make sure you setup the IMAP settings in Gmail as below. Otherwise, the program won't be able to delete bounced messages from the server. 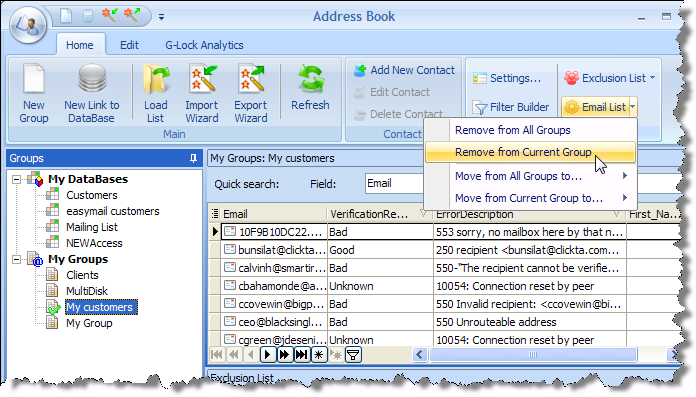 If you maintain groups of contacts in G-Lock EasyMail address book, you can delete bounced emails from the groups forever.